What makes certain things fly and others stay stagnant? It’s a formula of luck, precision, and finding something that people can’t get enough of. Malcolm Gladwell is an iconic figure in the Social Sciences for figuring out what makes people move in a certain direction or gravitate towards certain products. It’s something that social media marketers spend their lives trying to figure out. What do you need to do to get noticed? 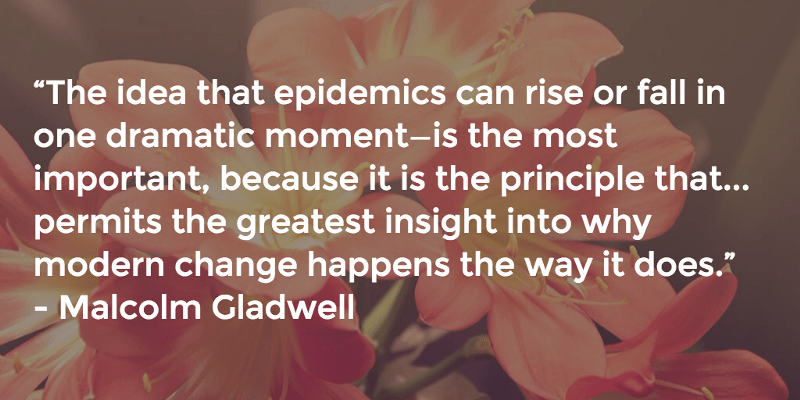 The Tipping Point was Gladwell’s first successful book, which he adapted from an article he wrote about the drop in crime in New York City and the social movements that made it happen. 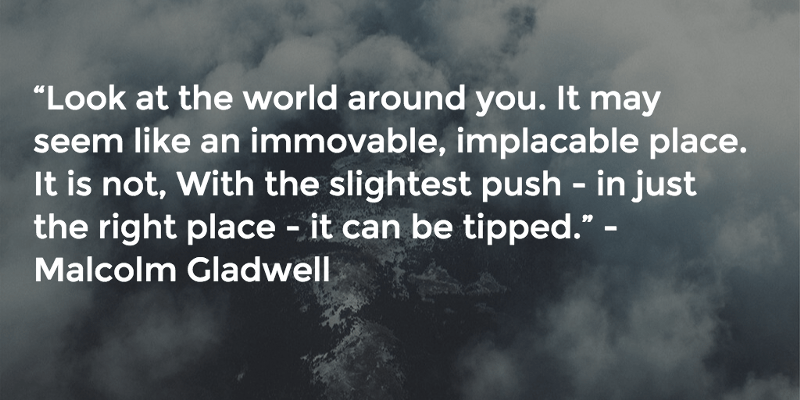 Gladwell knew something that all social media marketers would need to know just a few years later. He saw what made people attracted to ideas and products. 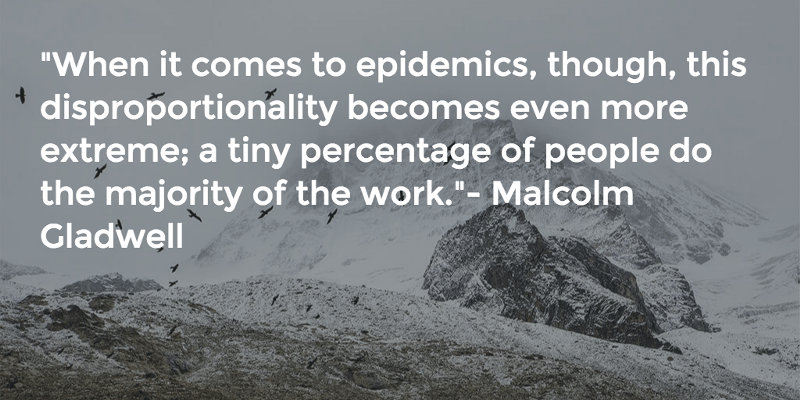 Gladwell saw the nature of what makes things go viral. He broke everything down into a few specific principles that help us understand how ideas move. Take a look at this breakdown, and think of how you might use these same thoughts in your day-to-day marketing duties. Businesses now call these “few” “influencers” on social media. If you have an Instagram account with hundreds of thousands of followers, you could make some serious cash by representing a brand. These social media users have many followers and their followers like what they post and share it. Businesses use these influencers to build brand awareness. It’s a simple, yet genius marketing tool. It’s the same reason we place “share” buttons on blogs and request people to subscribe to our blogs. Finding that right person can allow for anything unknown to become known in just a matter of time. This Principle involves to what extent a product or idea “sticks” in the mind of a viewer or consumer. Gladwell discusses many concepts that just “stuck” better than others due to the principles that made them undeniably attractive to audiences. Finding that niche in which makes you stand out from everyone else is crucial be it a product or a blog. Every post should have some sort of a take home message that will hopefully stick with readers and keep them coming back for more of what you’re offering. This is an important principle for content creators especially. The concept claims that people are sensitive to their environment and the situations happening within it. This is the reason why current events make such great headlines when big things are happening in the world. People relate to holidays, events, news making headlines and the things that everyone is talking about. As content creators, we give people the surge to continue talking about the things that everyone is talking about- just from a new angle. Below, you’ll find some of the best quotes from The Tipping Point that can help us all become better content creators and ultimately, better Internet marketers. What makes certain things fly and others stay stagnant? It’s a formula of luck, precision, and finding something that people can’t get enough of. It’s why Starbucks is like a drug. Our iPhones are like drugs. We get a certain defined benefit from using these products, even if only for a moment. Our iPhones make us feel incredibly productive at every waking hour, even if we’ve resorted to playing a game. Drinking Starbucks makes us feel sophisticated and energized. These brands have built these ideas specifically into our heads over time without us ever realizing it. As content writers, we can do the same things by building a blog as a go-to piece of information. If we look to bigger brands as examples, we can see that this development won’t happen overnight. Our blogs need to add value and make people feel that they are getting a benefit out of every single post. While every product and idea isn’t going to take over the world, the key is to take over your own corner of the world! It’s important to define what type of audience you’re looking for before you begin writing any content. The best place to start is not by looking at where others have succeeded, but thinking about where your exact audience is lurking. Write about what you know your audience will be interested in. We’re all over keyword stuffed pages that lack depth. We’re over catchy headlines with content below them that tell us nothing. “Tip” your readers by drawing them in with interest and substance. With the yo-yo craze of the 90’s, companies made their money with an epidemic of kids who wanted to play with yo-yos and be cool. The phenomenon didn’t stick because there was nothing more to it and no one managed to capitalize on it. There was no “next” when it came to the yo-yo in a technological era. In the modern day, many people believe that Facebook will die and some new social trend will come around. The truth is, if Facebook continues its current trend, the company will continue to evolve. Mark Zuckerberg is constantly looking for the next big thing with a focus and direction. As content writers, we all need to be constantly on the lookout for “the next big thing.” It’s why my e-mail inbox is never completely devoid of unread e-mails. Truly, as a content writer, you’re stuck in school forever because you’re constantly learning. We must always keep our eyes and ears open to the big picture of a business, subject or industry. When people have an idea, they usually picture it being a mass success, before they picture getting the product -or content in our case- in front of the right people. If we look at the massive success of Ellen DeGeneres, we can see this principle at work clear as day. DeGeneres didn’t become a successful talk show host because networks thought that absolutely everyone would want to watch her. In fact, networks rejected her because they didn’t immediately see what she had in common with the audience they were aiming for. Just like influencers in social media, reaching the right few people can lead to the right type of epidemic. If content reaches the right subset of an audience, it will ultimately become its own epidemic. The first piece of content is most likely not going to be the content that has the potential to go viral. Whether you’re writing content for yourself or for a business, it’s key to remember to let your audience get to know you. This is how an audience is built over time. Once one piece of content becomes known, the previous ones that were written will gain a reputation as well. 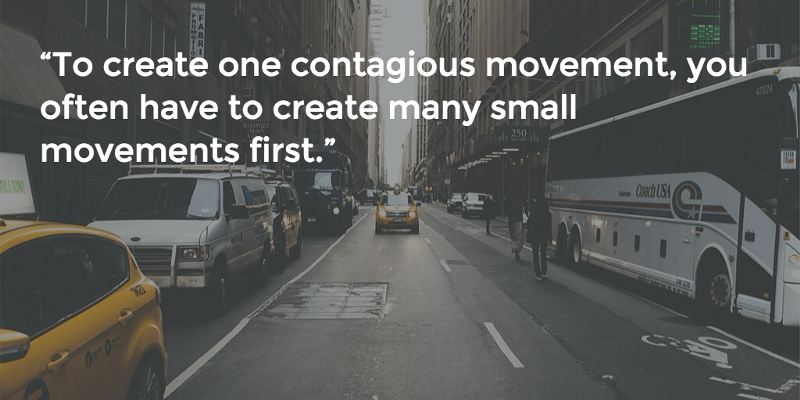 Piece by piece is how a seemingly viral movement is actually built. This usually just means that the billionaire has no interest in investing in the product. All companies started with one product, and if there’s interest in it, the “sharks” will invest in it and run with it. Without the first product, nothing can become a success in its own entity. In a day and age where content overload is rampant, it’s a wonder anything gets noticed anymore. The list of steps for something to go viral or become well-known seems to get longer. 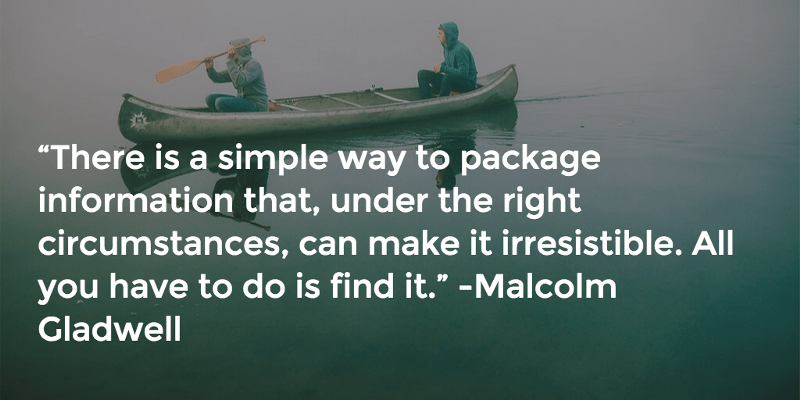 Malcolm Gladwell’s points allow marketers and content writers alike to see the world in a more simplistic way. Creating content that carries itself may not have a specific formula, yet his points hold true in just about every area of Internet marketing and content creation that we work with as entrepreneurs and writers. Finding that ultimate balance that makes our own little worlds “tip” can be done by looking at the principles Gladwell lays out. While much of the generally accepted, day-today marketing techniques we use are at the core of the discussion in The Tipping Point, it’s interesting to look at these ideas coming from a very different world. Since The Tipping Point was written before our lives were truly inundated with technology, we can look at Gladwell’s work as a prophecy of what was to come and something to be built upon.